Historic Event Space Hosts Live Classical Music India House "gets classical" with an intimate night of live classical music , this time around performed by 3 stellar pianists: Vassily Primakov, Natalia Lavrova and David Aladashvili. Hosted by Masterpiece Caterers and Yamaha Artists Services, the salon-inspired performance series GetClassical, pays homage to bridging the cultural ambience of the 19th century salons with today's New York City lifestyle. 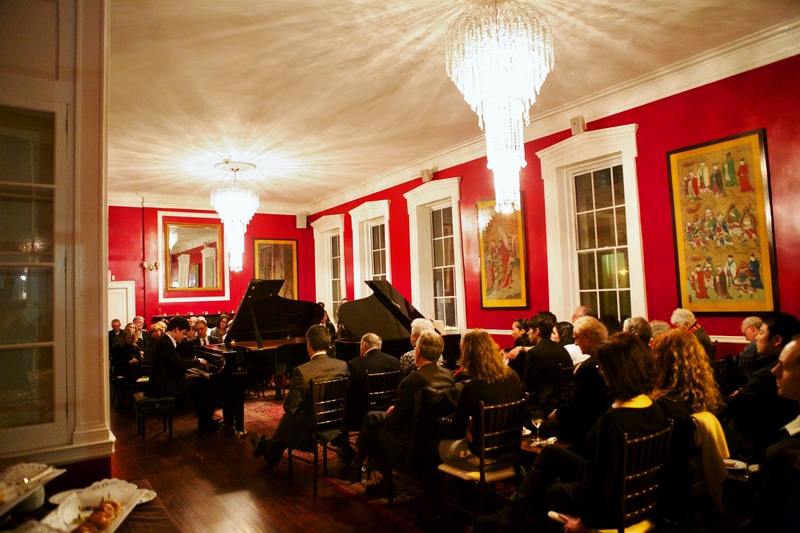 In bringing live performances to intimate event spaces, like the signature Hanover Room at the historic India House, GetClassical offers a leisurely yet exciting way to experience great classical programming, up close and personal. Bringing the after party to the concert, GetClassical attempts to avoid the disconnect between artist and audience commonly experienced at the larger concert halls. Classical music enthusiasts ranging from age 8 to 88 filled the ornate signature event space early in the evening, preparing for an evening full of virtuoso, romantic piano repertoire from the 19th century, including Schumann's famed cycle of "Symphonic Etudes", performed by the rising young star pianist David Aladashvili. The guests were welcomed with an aperitivo style wine and hors d'eouvres tasting hosted by Masterpiece Caterers. Smoked Salmon, Crab Salad and a variety of tea sandwiches filled the bellies of the eager music lovers. Yamaha Artist Services hauled two grand pianos into the midst of the elegant private room, so that the pianist-duo Vassily Primakov and Natalia Lavrova, who are just about to release their Rachmaninov four-hands CD, had an opportunity to shine together. Vassily Primakov, in particular renowned as a fine Chopin specialist, stunned the audience in an outstanding performance of six selected Chopin-Mazurkas In between pieces, the musicians spoke about their personal experiences with the music, from discovering a piece for the very first time, learning how to play it, to the moment of meaningful connection with the music and about sharing it with the audience. The intimate conversation with the artists was a treat for all the attendees, creating a full experience of classical music from inspiration to execution. Sharing the bench, all three pianists concluded the evening with a special encore, Rachmaninov's "Romance" four six-hands. For any music enthusiast, the evening was a rare opportunity to get a personal music experience and to meet with these young talents. GetClassical and Masterpiece Caterers continue to collaborate on more opportunities to bring live music to the historic Financial district in downtown Manhattan, stay tuned for more fun events in the future. If you're interested in sponsoring or supporting future events as part of India House's cultural programming, please visit www.MasterpieceCaterers.com or to learn more about GetClassical classical music blog and events please go to https://getclassical.org. Check out this video recap of the evening's festivities below. http://www.davidfinckelandwuhan.com/interviews.htmlChamber Music Encounters - On a perpetual quest for inspired music making By: Ilona Oltuski June 21, 2016 American cellist David Finckel and Taiwanese pianist Wu Han need no further introduction to visitors of “Chamber Music Encounters,” an intense 6-day educational chamber music workshop, and their latest brainchild under the auspices of Chamber Music Society at Lincoln Center. Culminating in a free concert performance at Alice Tully Hall, audiences shared the results of a dynamic coaching effort focused on communal mentorship between CMS’ Encounters renowned faculty and new talent. In the sessions, which implement paradigm-shifting coaching conduct based on workshops led by the late Isaac Stern, students are challenged to relate to multiple masters’ viewpoints while making the music their own. With live-streamed workshop sessions, CMS indulges even remote audiences with a behind-the-scenes peek into their chambers of music making, brimming with eagerness and motivation. Wu Han and David Finckel (Photo credit: Lisa-Marie Mazzucco) David Finckel and Wu Han, the powerhouse couple of chamber music named “Musicians of the Year” by Musical America in 2012, have spearheaded artistic leadership at CMS since 2004. Chamber Music Encounters, presented in collaboration with The Juilliard School, represents yet another educational initiative in their ever-growing New York performance series. A blend of artistic excellence and savvy entrepreneurship, the secret of this series’ enduring success is not only found in the sauce: a meaty title of largest worldwide producer and presenter of chamber music, but in the spice, as the institution has gained substantial critical acclaim for its omnipresent high standards, and inspiring artistic verve and vision. Together with Wu Han, his partner in life and music, Finckel began establishing a network of chamber music institutions during the early days of his busy touring and recording schedule with the eminent Emerson String Quartet, which he only just left in 2013. Educating young musicians has always front-lined the duo’s activities. Han and Finckel began their appointment as Artistic Directors of CMS at Lincoln Center not long after founding Music@Menlo in 2003 in San Francisco’s Bay area. Their beginnings at Lincoln Center in 2004 opened up the prospect of a dynamic bi-coastal artistic exchange.